What's the difference between spray foam insulation and fiberglass insulation? Fiberglass is a sort of cotton candy-like material made up of tiny glass fibers. Air becomes trapped within these glass fibers and delay the transfer of heat to the interior of the home. Spray foam insulation was originally developed in the 1940s as a way to insulate airplanes. Now, spray foam insulation is becoming more and more popular as a way to insulate buildings. Spray foam insulation is composed of different chemicals that expand once they are released into the air. This creates a foamy substance that adheres to the inner cavities of walls or onto roof tiles. Because there is such little conductivity gas in the cells of the foam, the substance is incredibly resistant to heat. 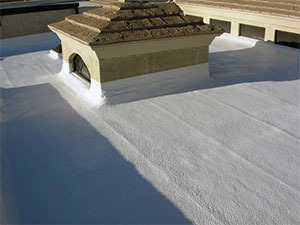 Foam roofers in Cave Creek often use polyurethane spray foam to insulate roofs as well. Environment. Spray foam insulation prevents a lot of energy loss. There are many types of spray foam variations that completely seal air leaks in buildings. This is especially useful in Arizona. Air conditioning use can be reduced by using spray foam insulation because cold air will not escape through leaks. Even though fiberglass insulation may be a lot cheaper initially, spray foam insulation could save you a lot of money on utility bills. Fiberglass insulation is usually not very environmentally friendly. Extreme climates. Spray foam insulation is great for extreme climates, especially very cold climates. Fiberglass insulation loses heat very quickly in cold conditions while spray foam insulation is unaffected by cold conditions. Lifespan. Fiberglass insulation will not need to be replaced for around ten to twenty five years, assuming the fiberglass material stays completely dry. Spray foam insulation, on the other hand, can last for over eighty years before needing replacement. Home structure strength. Spray foam insulation is permentant and stiff when applied to the inside of walls. This adds an element of added structure that flimsy fiberglass does not provide. Closed Cell spray foam insulation can add nearly 250% racking strength to a home's walls and roof. Reduces the chance of mold and mildew. Spray foam insulation protects against moisture. When moisture is prevented within the walls of a building, harmful mold and mildew cannot grow. Eliminating the risk of mold reduces wood rot within the foundation of the building and reducing the risk of mildew prevents potentially dangerous allergic reactions to mold spores. Noise reduction. Spray foam insulation is fantastic for noise reduction. Airborne sound transfer through roofs, floors, and walls can be greatly reduced by spray foam insulation, which is why this type of insulation is commonly used in recording studios and live performance venues. Tax reductions. In the United States, homes that use spray foam insulation more often than not can qualify for federal and state tax reductions, adding more money to your spray foam insulation savings. Price. Fiberglass insulation is much cheaper than spray foam insulation and is usually considered the "budget" option when it comes to insulation. However, you get what you pay for. Spray foam insulation is much more effective than fiberglass insulation, especially in extreme weather conditions. Spray foam insulation is often considered the best choice for extreme Arizona conditions. Popularity. Fiberglass insulation is the most commonly and regularly used insulation material. Over 85% of American homes use fiberglass insulation. has a much larger market share than spray foam insulation. Ease of installation. Fiberglass is much easier to install than spray foam insulation. Fiberglass insulation can be installed by homeowners easily, while spray foam insulation must be installed by a spray foam roofing company. I’m taking the spray foam roofing side! Who can I call? 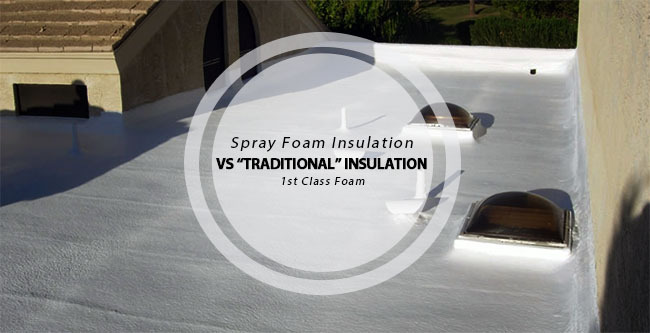 1st Class foam Roofing And Coating, LLC is a spray foam roofing company has been installing quality foam roofs for Arizona residents and businesses for many years. Our top-notch team of SPFA Certified Applicators and Carefree foam roofers have experience with many types of applications and will deliver quality services including foam roof installation to you. We boast a long list of fantastic references and a management team with over seventeen years' experience in the field. With every job we offer, you get a free consultation, problem identification, expert recommendations, budget planning, customized project ideas, and more. Call us to today to get a head start of your foam roof installation.